The above info came from Emma N., and was edited by yours truly (contact me). Tomoe Yukishiro is one of the most important characters in Samurai X . She is important because of her relation to Kenshin, which is pretend wife. At first, she plotted on Kenshin's life, because he had killed her fiancee, who was a bodyguard. 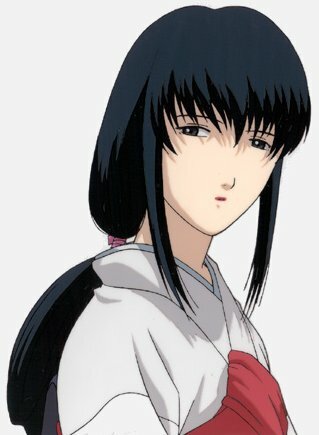 But, following an accident in Kyoto, she pretends to be Kenshin's wife, and goes and lives up in the mountains with him, so he can escape from the police. And her plan to kill Kenshin would have worked, if they had not fallen in love with each other the day before the plan was to be carried out. Unfortunately, due to a series of accidents, Kenshin slays Tomoe (accidentally!). As she lay dying in Kenshin's arms, Tomoe made the second of the two cuts on Kenshin's left cheek that made up the cross-shaped scar by which the Battousai is most commonly recognized. However, it is not until the Meiji Revolution has ended and the war is over that Kenshin vows never to kill again. The above description came from Emma N. and Jonathan, and was edited by yours truly (contact me).